In the relative dimness of the Maori Court in the Auckland War Memorial Museum, where a projected image of a silver fern flutters on the floor, and tourists either stand around perplexedly searching for the exit, or pose smilingly beside ancient artifacts for the camera – there you will find a great waka taua, Te Toki a Tapiri, the Adze (or axe) of Tapiri. One of the greatest attractions in the Auckland Museum is a very fine example of a Maori war-canoe, and without a doubt the finest specimen in existence of a Maori war-vessel. The fact that she was built in the Wairoa district should call up the interest of all my readers. Her builder was a Wairoa man, Waaka Tarakau, a chief of Ngati-Matawhaiti, a hapu of the Ngati-Kahungunu … The tree (a totara, of course) from which the canoe was fashioned grew at the back of the present-day Clydebank special settlement, and it was cut there in the laborious manner of the Maoris before the days of the axe and the saw. It was hauled down to the coast, so the late Sir James Carroll informed the writer, by thousands of men in relays, to the inspiring incantations and songs of the old tohungas. When the log reached Matawhaiti many hundreds of men were engaged in fashioning the craft, but the chief builder and architect was Tarakau, and he named the vessel Te-Toki-a-Tapiri (the axe of Tapiri), after one of his ancestors. The canoe was eighty-four feet long and had a beam of six feet. The ruawa, or topsides, were added by Tamati Parangi and Paratene Te Pohoi, and the canoe was presented by the builder to Te Waaka Perohuka, of the Rongo-whaka-ata tribe at Poverty Bay, and he received in return, as was the custom of the Maoris, a celebrated historical garment called "Karamaene." The carving of the canoe was carried out at Te Angaparera, on the left bank of the Waiporoa river, nearly opposite the Orakaiapu pa. The principal tohungas engaged in the work were Te Waaka Perohuka, Timoti Rangitotohuihura, Wiremu Te Keteiwi, Patorounu Pakapaka, Natanahira, Taumata, and Mahumahu. In 1853, Perohuka presented the vessel to the great northern chief, Tamati Waaka Nēnē, and his brother, Patuone, who sent to Perohuka a pie-bald stallion called "Taika" (Tiger). The horse was later given to Tarakau, the builder of the famous canoe. After the arrival of the canoe in Auckland waters, where she appeared among the fleet surrounding the Pandora, she was sold for £400 to chiefs of the Ngati-te-ata tribe (Waiuku) and taken to Manukau. The price in reality was £600. According to Mere Whaanga, in A Carved Cloak for Tahu, 2004, the extra £200 purchase price was for two greenstone mere at £100 each. In 1863, with war breaking out between Waikato tribes and the colonial government, it was ordered that all waka in the streams leading to the Manukau Harbour be seized. 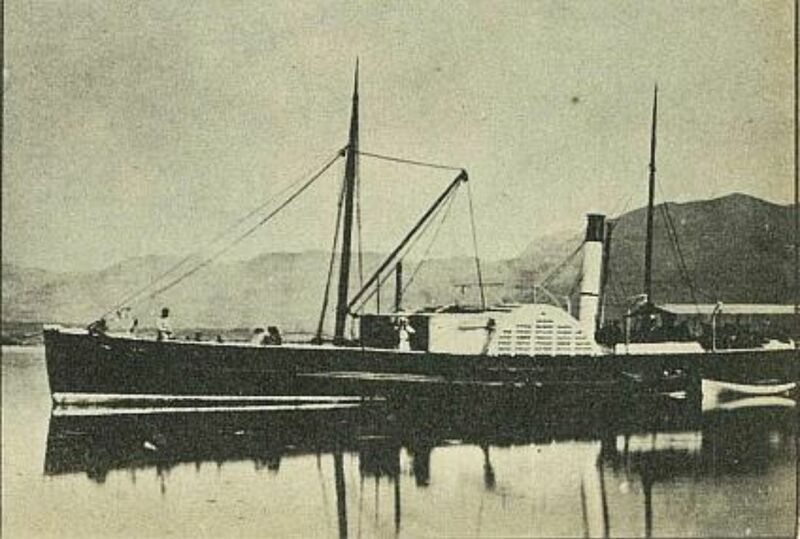 The paddle steamer Lady Barkly, crewed by Onehunga Naval Volunteers under one Captain Thomas Parnall, was originally, so it is said, (image from Nelson Photo News, March 1962), via the private yacht of Governor Sir Henry Barkly of Victoria in Australia. It appeared in Dunedin in January 1862, and was purchased for commissariat service on the Manukau Harbour in July 1863. The intention had been for the Lady Barkly to be used to trade between Onehunga and Drury, supplying both provisions and munitions. She did strike a bit of initial difficulty with the ways of the Manukau streams. The Lady Barkly is still stuck on a rock down the stream between here [Drury] and the Manukau. She will I presume have to wait for the spring tides. I think it would be wise to have stakes driven in down to the Manukau, indicating the course of the stream, so as to avoid these long detentions from which much loss must ensue. Then came orders for all waka along the Manukau shoreline and streams to be confiscated or damaged, so as not to be a threat during the war. The Waiuku Maori were peaceful toward the Crown – but this didn’t mean that they were not included in the blanket operation. On Monday the steamer Lady Barkly landed at Awitu a party of the Onehunga naval brigade under Captain Parnel [sic]. They proceeded to the native settlement there, but the rebels had decamped, leaving in the hut the fire still burning, and the remains of a hasty breakfast of corn. It is thought they had been notified of the approach of the naval brigade, as three shots were heard by the brigade as they were approaching the settlement. The Lady Barkly then proceeded to Waiuku, where she arrived on Tuesday morning. The object of the visit being to remove any canoes lying in the creeks. The same day the brigade, assisted by a party of the Waiuku force, under Captain Lloyd, secured a number of canoes belonging to the Waiuku natives. This step the natives do not object to, but they allege that their whares were entered by the men, and clothing and other property carried away. It is certain that other articles besides canoes came under the inspection of the men, and that Captain Lloyd ordered the men under his charge to leave the articles in their places. The civil and native authorities intended to institute a search on board the steamer to-day, in order to ascertain if the allegations, of property having been carried away, were true but the very gusty afternoon has, I believe, delayed their intention. The natives have not made any unpleasant demonstration on the matter, but they are apprehensive that if the distinction between their property and rebel property becomes overlooked, the distinction between their persons and those of rebels will be overlooked next. A large war canoe, 94ft. long, for which £600 was paid by the natives to the late chief John Hobbs, was discovered roofed in at a place half way between Awitu and Karaka, As there was some question raised by the gentleman who acted as interpreter about the propriety of removing this canoe, the lower stern-post only was taken away, and brought up by the Lady Barkly. Since then, we believe, orders have been given by the authorities to fetch this canoe up to Onehunga. We understand this is one of the best finished canoes in New Zealand. The single planks along the sides are 83ft. long, and well carved from stem to stern. Later Henry Alfred Home Monro would relate how he, as appointed native interpreter, was aboard the Lady Barkly at the time the stern post of Te Toki a Tapiri was removed and confiscated by the naval volunteers. At a place called Rangatira, if I remember aright, we found this large canoe Te Toki-a-Tapiri drawn up under a shed. Looking at the fine canoe, I felt it would be a pity to take her to Onehunga, where for a certainty she would be destroyed or otherwise so damaged that the Government would be required or otherwise so damaged that the Government would be required to pay the £600 which, I understood, was the price given for her by the Ngati-Te-ata. I directed, therefore, that the ‘haumi’ or stern portion, alone should be taken, as when that was unlaced and removed the canoe would be practically useless until replaced. The Naval Volunteers were rather sulky at this, as they especially wanted this canoe to grace our triumphal return to Onehunga. The canoe was at this time in excellent condition, nothing being wanting except the ‘puhipuhi’ (feather decorations), which the Volunteers had unluckily discovered in a whare at Waiuku containing the belongings of the deceased chief Katipa. This they had cut up into lengths to adorn their heads. On our return to Onehunga the haumi was placed in the Customhouse store for safe keeping. From Lambert, The Story of Old Wairoa and the East Coast, via A Carved Cloak for Tahu, p.226. For the next four years, Te Toki a Tapiri was to remain on the beach at Onehunga. There is a story that crew from the HMS Harrier tried to blow the waka up at one point – I haven’t found a contemporary report about that, as at the time of writing. How long the waka taua would have remained on the beach under ordinary circumstances, I couldn’t say. In 1867, the Ngati Te Ata had started proceedings for compensation, but were getting nowhere. However … 1868 was to be a significant year for Auckland. The Duke of Edinburgh, Queen Victoria’s son Prince Alfred, was due to come, and the city fathers were determined to put on as fine a show of British imperial pomp and splendour as their city in our far-flung colony could muster. A meeting of the Native Committee was held at the City Board Room en Saturday forenoon. Mr. Swanson stated that he had gone to Onehunga on the preceding day to see if the large canoe lying there, the Toke-a-Tapiri, could be made available on the approaching visit of his Royal Highness. This canoe, we may state, was bought by the Ngati-teata, of Waiuku, from a southern tribe, for the sum of £500 cash which, we believe, was considered a moderate price. At the beginning of the war, a party of Naval Volunteers went out on the Manukau and, finding the Toke-a-Tapiri in the creek, seized her. 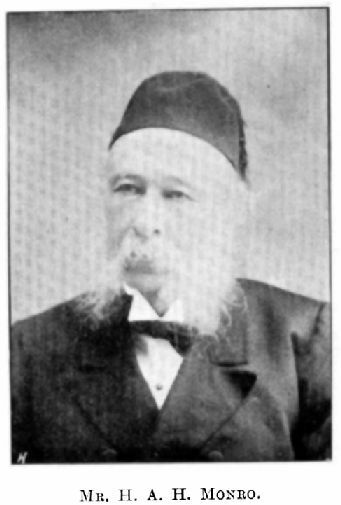 Mr H Monro, now Judge Monro, accompanied the expedition as interpreter, and told the volunteers on no account to touch the canoe, as she belonged to friendly natives. His remonstrances were, however, unheeded; the volunteers wanted a trophy of their valour, and brought the canoe in triumph to Onehunga. There she was drawn up in the Customhouse yard, and being carelessly placed, and exposed to all weather, has received considerable damage. The Ministry of that day offered the canoe as a present to Sir George Grey, who said that if they would put her in order he would give her back again to the Waiuku people, from whom she ought never to have been taken. Nothing was done by the Government, and the Waiuku people have now a claim of £500 before Mr. Beckham's Court for the canoe, and there can be no doubt they are entitled to the money. In the meantime Paul, on behalf of the Ngatiwhatua of Orakei and Kaipara, says that if the cracks in the body of the canoe are repaired so that she can float, he will decorate her so as to be available for the approaching visit of the Prince. But the committee feel a difficulty in the matter. The General Government lament that the canoe was ever touched, and will not hare anything to do with her. His Excellency says, we believe, that he never accepted her. The Waiuku people state that the Government took the canoe, and that now they have nothing to say in the matter. However, the Native Committee will take steps to ascertain what it would cost to have her brought over to the Waitemata and repaired. A meeting of the Regatta Committee was held yesterday at Messrs. Cochrane’s rooms. The chairman intimated that the Government had placed £150 at the disposal of the committee for Maori races, and it was proposed to have the large canoe lying at the Custom-house yard, Onehunga, put into good repair for a Wakataua race. The large wakataua canoe which has lain at the Customs, Onehunga, since it was taken by the Government from the natives, was brought into town last evening in order to be placed in the hands of Mr. Duthie, shipwright, for repair, when it will be placed at the disposal of the natives for the regatta to be held on the arrival of his Royal Highness the Duke of Edinburgh. This was Alexander Duthie, a shipwright who operated from Customs Street. The Secretary [of the Regatta Committee] intimated that the wakataua canoe, for the repair of which £30 had been set aside by the Regatta Committee, had been brought into town, and was in the shipwright's hands. Come the day of the regatta – all went ahead as planned. Except that the Duke wasn’t there. He’d been shot in Sydney, and had had to head back home to England early. The regatta day in April 1868, though, was to be the second-to-last documented occasion where Te Toki a Tapiri was to be afloat. At half-past eleven o'clock the Maoris gathered at the firewood wharf, where were the only two canoes that had put in an appearance. If the weather had been finer one or two more would have come, but it was quite unsafe to be outside the Heads in a canoe on such a day as yesterday. Another reason for non-arrival was the fact that the Prince was absent. When the natives heard that the Prince was not coming, they took it for granted that the whole celebration would be dropped. The two canoes were the Toke a Tapiri, brought up from Orakei by Paul, and manned by the Ngatiwhatua, who boast of their power and skill as paddlers. The other was the Akarana (Auckland), from Waiwharariki, the native settlement at Shoal Bay, which was entered by Te Hemara, and manned by a mixed lot of Ngapuhis, Waikatos, and other tribes. Both canoes were finely carved, and decorated with albatross feathers, and the paddlers all wore white feathers in their hair. About this time, a large canoe was seen coming up from Taupo, Firth of Thames, and truly the men on board must have had a rough and dangerous morning's work. 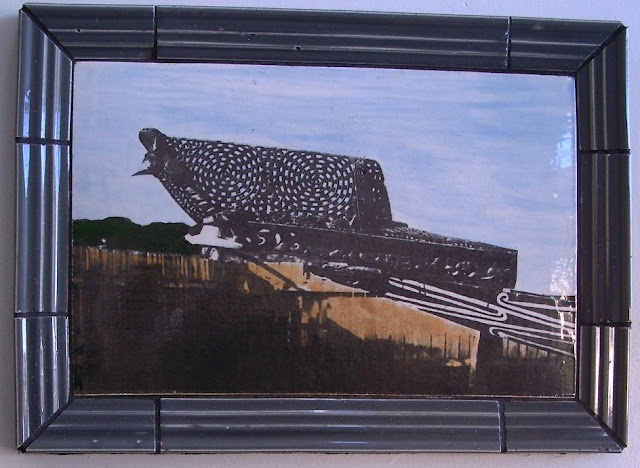 This canoe was Ngapuhoro, belonging to Ngatipaoa. The Toke a Tapiri was manned by fifty-eight paddlers, and the Akarana, which is considerably smaller, hid twenty-six on board. Onboard the Toke was not so disagreeable as we had expected, having former canoe trips in mind in calmer weather. She rode over the waves like a duck, and only those near the bow were wetted by the spray. It was most desirable that the three canoes should start, so as to ensure a good race, but Ngapuhoro was seen to go into St. George's Bay, and it was pretty obvious that, after pulling up from Taupo against wind and sea, the men would be in no condition to contest for the prize. Captain Guilding went off in a waterman's boat to bring them up, but in the meantime it was determined to start the two, giving £50 instead of £80 to the winning canoe. At the firing of the gun, off they rushed, through the stormy waters, towards the flagboat moored off Freeman's Bay. The men were all stripped to the waist, and plied their paddles with, energy. Of course, in each canoe were what Europeans would call fuglemen, gesticulating with energy, and timing the paddle strokes. The course was right in the teeth of the wind, and before the flagboat was reached every man on board both canoes was thoroughly drenched. It was pretty soon evident that the Akarana was no match for her more powerful antagonist, and that the Toke would come in an easy winner. The course was to round the Bella Marina hulk, and back to the flagship, but, on the canoes passing the Tauranga, they were called on to pass round the Brisk, so that his Excellency the Governor might see them. The Toke rounded the Brisk all right, and came up to the Tauranga swiftly, the men shouting a ngeri. All those on board gave a cheer, and were so busy looking at the demonstrations of triumph made by the Maoris that they never noticed that the unfortunate Akarana, which had reached about halfway between the Brisk and the Tauranga, was settling down in the water, and almost covered by the waves. She was scarcely moving, in spite of the energetic exertions of those on board. From the waves breaking over she bad get almost water-logged, and, the strain being too much for her, she cracked in the centre. The natives on board the Toke were the first to notice the danger, and, letting go the ropes which held them to the Tauranga, the canoe was let drop down swiftly to the rescue. But before the Toke got to the place, the Akarana, in the midst of a fierce squall, went down, leaving the men struggling in the waves. Most of them leaped into the water, and then they turned the canoe bottom up, so that part of it was above water to hold on by. A few got shoved down below the canoe, but came up again by-and-by. It was an anxious spectacle to those who witnessed it, for although the capsizing of a Maori canoe is considered usually to be quite a trifle, still after the men had pulled a long distance, and in such a sea, there was a chance that some of them would be quite exhausted, and sink amidst the angry waves. 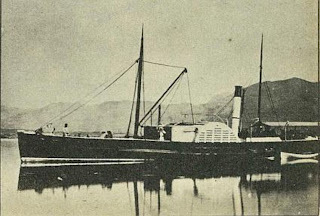 Joseph Cook's boat was alongside, and was let go; the boat belonging to the Tauranga was let down with all expedition indeed, in about five minutes four boats were nearing the scene of the accident. Spectators are naturally impatient when they think that life and death may be in every moment, but on this occasion we are bound to say that no time was lost when it was evident that there was danger. Possibly the men might have righted the canoe, which they often do under such circumstances, but the Akarana was too far gone for that treatment. The Maoris scrambled off the canoe, or were hauled out of the water where they were bobbing about pretty thickly, and finally,with the exception of one or two who were picked by the boats, they all got safely to the Toke, which had then about ninety men on board. This was too many considering the weather, and it looked as if we were to have another case of swamping. However, thanks to Mr [Swanson] and Mr Duthie, the Toke is now a good seaboat, though lately lying in pieces in the Custom-house-yard, Onehunga. It had been arranged that after the race the natives should go on board the Brisk and have a war dance, but the accident interfered with that, as the men were in no humour for dancing after getting such a ducking. The Toke therefore was paddled ashore, and the boats picked up some of the paddles and the clothes of the natives. Apparently the accident had not been noticed from the Brisk, for it was not till all danger was past that a boat put off, which, however, took in charge the broken canoe. If the same number of Europeans had been thrown in the water, we should have had a score of men drowned. The last documented time Te Toki a Tapiri was on the waters of the Waitemata, or any other waters for that matter, was for the special Maori welcome to the Duke, who finally made it here in 1869. Haere mai, e te manuhiri tua rangi. Kukume mai ai- haere mai. Welcome, stranger, from the distant land. From the other side of the heavens. Welcome! The movements of the canoes were directed by Paora Tuhaere. ... certainly shows a carving of similar pattern and size to that presently on the waka today (my photo below). 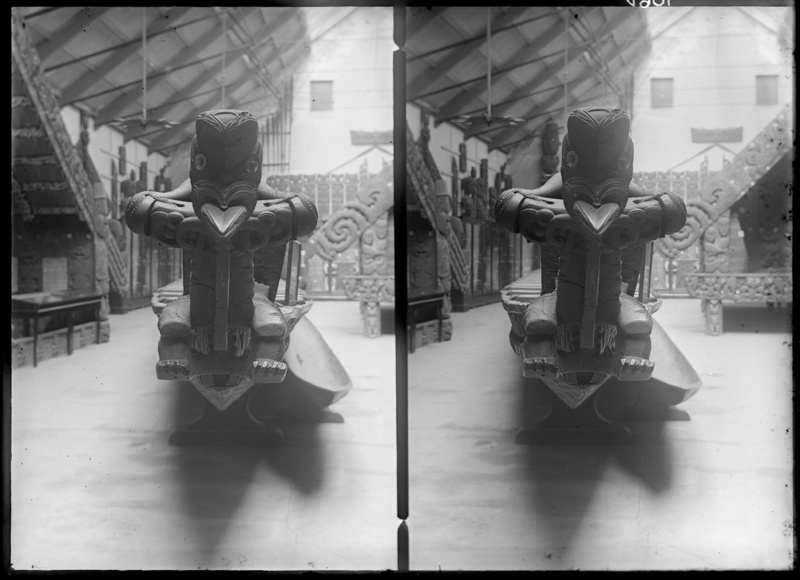 Compare with this image from the Museum's photo collection, said to be a prow for Te Toki a Tapiri, but showing marked differences in design. Was this an early attempt to copy the prow? If they were going by the Kinder image, for example, that seems to show that any arms on the figure are missing. Therefore -- perhaps, in organising or finding a replacement, the pattern for the arms was guessed at. It seems to have continued into the 20th century, when this photo (below) was taken. Note the "arm" of the figurehead, which appeared to have 4 or 5 digits, compared with the more abstract representation of the limbs today. This photo in Flickr, said to date from 1963, shows that the prow's arms are still in a different position compared to today's carving. At some point after 1963, it seems, the tauihu carving at the prow was altered. Compensation to the Waiuku hapu for the confiscation of Te Toki a Tapiri took another 10 years after they initiated action through Judge Beckham's compensation court in the 1860s. Nos. 15 and. 37.—Petitions of Hori Tauroa and 4 Others, and Henare and Aihepene Kaihau. Petitioners pray for compensation for losses suffered during the Waikato War, and particularly for compensation for the loss of the great canoe Te Tokiatapiri. That, the war canoe having been captured by the Colonial Forces during the war in Waikato, the Committee cannot recommend any relief or compensation be granted the petitioners. 14th August, 1878. I—l. 3. Native Committee 1879 voted £200 compensation. Financial Year 1880-1881 – £200 compensation paid for canoe Tokiatapiri. No. 8 of 1882.—Petition of Hori Tauroa. Petitioner states that a sum of £200 was paid to the children of Kaihau for the canoe Tokiatapiri, whilst he had got nothing. He says he was entitled to a part of the price, and prays it may be paid to him. So now, the Government owned Te Toki a Tapiri outright, considering that a purchase had effectively been made, for £200, for the waka taua. Soon after this, the remains on the Orakei beach were offered to the Auckland Institute and Museum in Princes Street. Four years later -- it was still lying, rotting, on the beach. Mr Fenton said it was 4 years ago since, through his exertions, a very beautiful war canoe had been presented to the Institute, but it was still lying rotting on the Orakei beach, and this being so he thought Dr. Moore arid Mr Stewart were over-rating the interest taken in Maori antiquities by the Institute, He had offered the use of the Choral Hall for its storage, but nothing had been done. Mr Stewart thought that as they now had funds they should get the canoe. The Chairman said that if they had no room for the canoe they had room for Mr Fenton's vast stock of Maori lore. The resolution was carried, and the meeting adjourned. To be fair to the Institute, they seriously had no room for the waka at all. 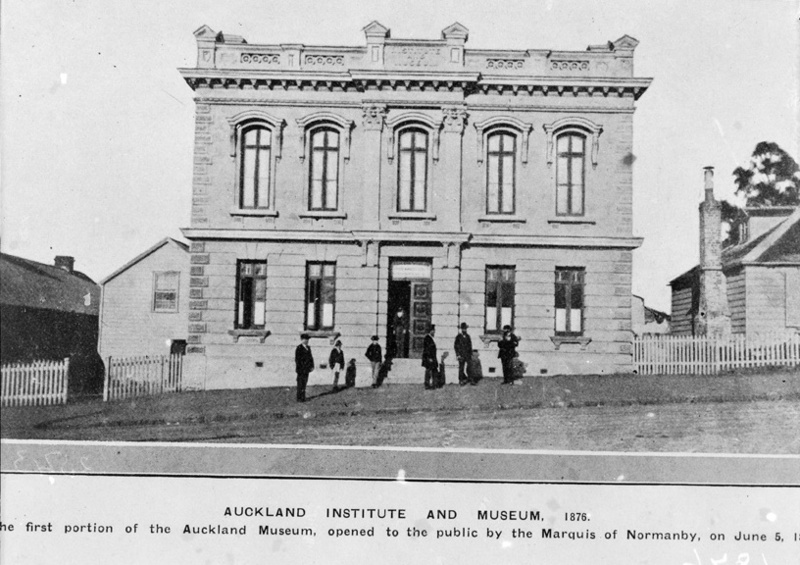 The second brick building was too compact for something of Te Toki a Tapiri's dimensions; they probably had to wait until 1892, when the new extension was added, to put the waka on display. Hopefully, before then, they had it under some kind of cover to arrest the deterioration. The large canoe which is known as the Toke-a-Tapiri, is an excellent specimen of Maori architectural art, now virtually a lost accomplishment amongst the natives. It is a waka taua or war canoe of the largest class, 82 feet in length from figurehead to sternpost, carved out of one large totara log, totara being a timber famed for its durability. When fully manned in the olden time the canoe would hold considerably over a hundred warriors. The big canoe has quite an interesting history. It is at least thirty years old, having been built in the Manukau by the Maoris prior to the year 1863. 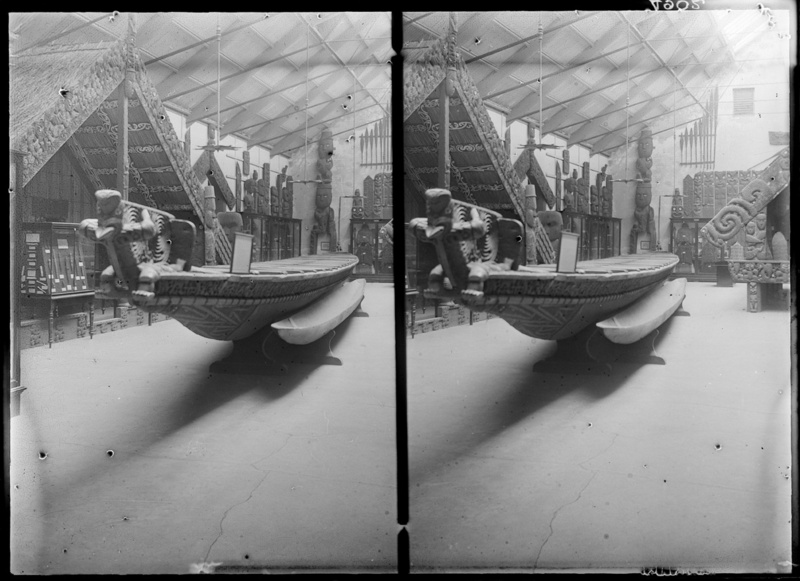 It was one of the Maori canoes seized by the troops at the outbreak of the Waikato war, the craft belonging to the natives resident at Waiuku. The Manukau Navals, a militia corps under Captain Lloyd, were ordered in 1863 to capture and destroy the Maori canoes lying in the creeks falling into the Manukau Harbour, in order to cripple the power of communication amongst the hostile natives. Many canoes were seized and destroyed. At Waiuku the militia found hundreds of Maori women and children, who calmly watched the work of destruction of their little fleet, the able-bodied men being all away at the war. It was found very difficult to remove the big canoe, the Toke-a-Tapiri, and it required the whole strength of the force to haul it from the canoe shed to the water. It was then towed up to Onehunga by steamer. This canoe was the only one which escaped the destroying axe, it being such a fine craft that it was thought a pity to break it up. It was left lying on the beach at Onehunga for many years, until it was eventually placed in the Auckland Museum. Its topsides, figurehead, and stern-post are carved very elegantly after the Maori fashion, and are ornamented with the iridescent paua shell. The canoe is still in an excellent state of preservation. Compare the stereoscope image above, with mine taken now (below). The arms of the prow carving do appear to have been replaced. 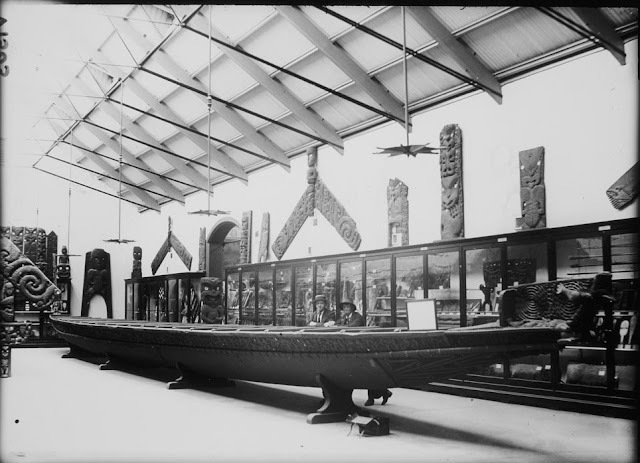 In the Auckland Museum may be seen a huge Maori war canoe 82ft long, with a beam of 7ft, built in or about the year 1835. This canoe has a beautifully carved figurehead, the sides and ends are also covered with artistic Maori carving, such as are seldom to be seen nowa-days; and is capable of accommodating no less than 100 paddlers, besides others. Not everyone was impressed by the Museum's growing Maori collection. Dr. Bakewell said that about £6 had been spent on the Museum proper during the year, while one thousand pounds was being spent on the Mair collection. Why anybody should want to pay all this money for the most hideous object produced by human beings he did not know. If there were any beauty in the things, or if they were even a rude commencement of a higher art, one might take some interest in them, but here was a set of cannibal savages who, in the 20th century, had not reached beyond the stone age, and were very imperfect at that. He had been astonished to learn that the Maori canoe was made with steel tools. He considered such things of no interest at all. They were simply barbarous and hideous—pieces of wood chopped about by a set of savages. He would rather they were buried out of sight, and certainly could not see any reason for starving the beginnings of a valuable educational museum as the Auckland Museum was for these horrid monstrosities. A morbid taste was growing up in this part of New Zealand for accumulating horrible, ugly, and even obscene objects, because they belonged to the Maoris. We had nothing to do with the Maoris, we wished to supplant the Maoris, and he hoped we would in the course of time. He was sorry to hear they were on the increase, because they were a very low type indeed. Mr Stewart said if Dr. Bakewell knew more about the Maoris he would hardly call them savages. In going into the ethnology of the Maori race they were carrying out one of the declared objects of the Institute. Dr. Bakewell's argument, if carried out, would sweep away nine-tenths of the British Museum. The Rev. Dr. Purchas said no doubt members of the Council would prefer to have old specimens of Maori art, but with regard to the canoe, there was no canoe in existence which had been carved by the Maoris with their own weapons. As a race the Maoris were fully equal to many of the races that prided themselves on being great races. He would sooner trust the Maoris than a large number of the men who prided themselves on being superior. He thought the less we compared ourselves with the Maoris the better for ourselves. Before the completion of the new museum on Auckland Domain, the great waka needed to be moved from its home of some 36 years. This operation was carried out in July 1928. Laboriously drawn through Auckland's back streets on Monday, the famous Maori canoe "Tapiri's Axe," now has a new home in the War Memorial Museum in the Domain (states the New Zealand Herald). The transport of the craft called for delicate manoeuvring, but although tedious, it was accomplished without a hitch. 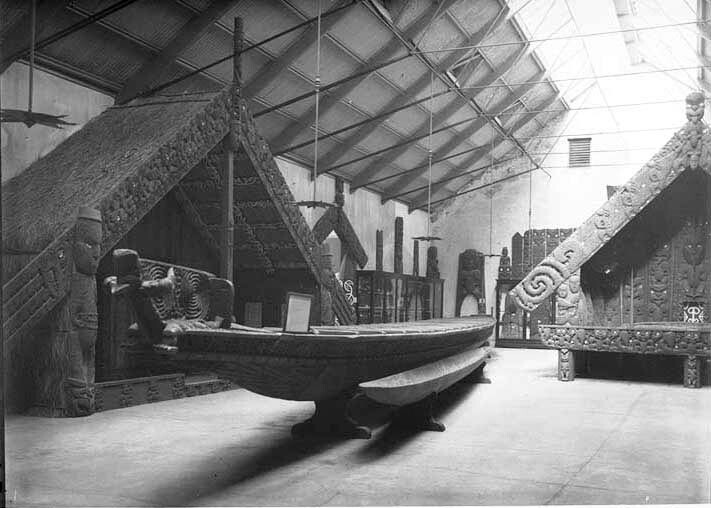 For many years the canoe has been housed in the Maori section of the old museum in Princes street, now closed in anticipation of the opening of the new building. A whole day was occupied in jacking the canoe on to a special trolley in preparation for the journey. Then it was found necessary to enlarge an archway in the brick wall in order to reach the street. Hitched to a motor-lorry the trolley bearing the canoe was drawn out to the street without much difficulty, but the journey to the Domain was slow. The canoe was made secure between two 50ft Oregon beams, each weighing a ton. In addition the trolley weighted two tons and the canoe 4½ tons, so that there was a total load of 8½ tons for the lorry to draw. The trailing of a red flag at the stern of the canoe had no special significance, apart from the fact that the historic craft is 79ft 9in long, and the overhang was therefore more than sufficient to require the observance of the city bylaw dealing with such matters. Almost four hours were occupied to take the canoe by a circuitous route to the new museum. A special bridge had been built over an excavation to enable the exhibit to be brought into the building by a back entrance. Skidding at that stage caused a slight difficulty, necessitating the services of another motor-lorry. Packing with bags filled with sawdust enabled the canoe to be transported without damage, and it was left on the trolley awaiting final placement. As the canoe entered its final home it had as passenger Mrs T F Cheeseman, widow of the late curator of the museum. Mrs Cheeseman took a similar ride when the craft first entered the old museum, and sentiment prompted her to repeat the performance. During World War II, there were concerns that the musem, a clear and prominent landmark, might be targeted during air-raids. This image, also from the museum photo collection, shows sandbagging around the waka in progress. The interpretive panel that stands beside Te Toki a Tapiri in the Maori Hall today has errors in the last few lines. "Compensation was paid to Ngati Te Ata at the end of the war." The sign refers to the Waikato War, which is accepted to have lasted from 1863-1864. Ngati Te Ata received their compensation in 1880, quite some time after the war's end. "In 1869 Te Toki a Tapiri was the highlight of a regatta on the Waitemata Harbour celebrating the visit of Prince Alfred, Duke of Edinburgh." The actual regatta was a year earlier, in 1868. In 1869, Te Toki a Tapiri was one of a number of waka taua which was used as part of the official Maori greeting to the Duke. "Ngati Whatua of Orakei under Paora Tuahaere later cared for the canoe until it was presented to Auckland Museum by the Government in 1885." Turns out, according to the newspapers of the day, the canoe was offered to the Museum around 1881 -- then left on a beach at Orakei until, most likely, 1892 when the Museum's extension at Princes Street was completed. Te Toki a Tapiri, writes Mere Whaanga, "is a hugely significant taonga of the Ngati Matawhaiti, Ngati Kahungunu and Rongowhakaata. When the Maori galleries of the Auckland War Memorial Museum were to be refurbished in 1999, the people of Ngai Tahu Matawhaiti and Iwitea discussed the implications of the project ... The refurbishment project proceeded apace, and, concerned at the lack of adequate consultation, a deputation of Ngati Kahungunu ki Wairoa travelled to Auckland for a hui on 1 September 1999 ..."
The representatives expressed concerns over the refurbishment of Te Toki a Tapiri -- new lashings, repainting, decorating the craft with new puhipuhi. It wasn't "acceptable to try to decorate the waka to make it look other than the venerable and aged taonga that it is. Every scratch and crack speaks of its long and turbulent history ... Te Toki a Tapiri resides in an institution devoid of contact with its rightful kaitiaki -- those able to whakapapa to Tapiri who have been appointed by Ngai Tahu Matawhaiti to fulfil that role. However interesting a display may be, it undermines the nature and meaning of taonga if it negates, or even ignores, the relationships that give life to material forms." Compare the photo above with this image from 1961 (Museum photo collection). Some markings on the cross timbers are now gone, and the lashings renewed and altered since 1999. ... I don't think Te Toki a Tapiri's long story is yet over, somehow. Thanks for that information. I'm happy to have stumbled on your blog. I remember visiting the museum often as a child, when the Maori section seemed to be regarded as relics of a time long-past.I was very pleased to see, on a recent visit, that authentic restoration of Hotunui is taking place. It inspired me to do a little digging to find out the real story behind the wharenui and the waka. Two years after his death Governor Grey ordered all the waka from Ngatiteata be confiscated, and 11 canoes were taken in total. Te Katipa's sons were captured at the battle of Rangiri and were denied any recognition of their birthright to Waiuku, Manukau, and any other rights that were theirs (Maori were only given land by the government in the 1900's if they didn't own any). Within 60 years Te Katipa's mokopuna had lost everything, so much so they were being charged with stealing a pair of boots. Katipa had a fighting force of 1000 warriors but by the turn of the century there were less than 250 Ngatiteata alive, with any lands granted given to his slaves. Katipa was a learned man who wrote numerous letters to government etc, whereas my grandparents couldn't even read and write. They worked in vegetable gardens their whole lives on land they didn't even realize was once theirs. I had been told, as a young girl, that another family owned Waiuku, but had been told by another shortly afterward that those who claimed Waiuku were only caretakers who had taken over from our family. Just these past few months I have been searching my ancestry and realize just who my family really was back then not 200 years ago. Katipa himself seems to have been written out of the history books and I can't believe that they have done this to him. Tribes that have zero ownership to Te Toki have lied about their claims to it. All waka were built, craved etc in the same way and Te Katipa owned that canoe, outright. In fact if this were not so then there would have been trouble over its ownership from the beginning, as there was with other canoe. You are right about this not being the end of the Te Toki o Tapiri's story. My family have not only been denied the right to our heritage, but also to all that Te Katipa stood for. I will get justice for him, for my family and I will not stop until the history is set straight. For not only am I descended from Te Katipa but I am descended from 4 children of Te Rauangaanga and Parangope of Ngati Teata, and it is in my blood to not only fight, but to win. Thanks very much for your comment. I wish you all the very best for your quest to set things straight. A mural at the wrong speedway?